Nominations will also be taken from any members wishing to become trustees. After the meeting Charlotte Dove our Community Gardener in 2015 will talk about her Seed Saving trip to America. Next open garden session after Wassailing – 24th January. We will not be open on Wednesdays in January. We have a cookery demonstration with local food writer Rachel de Thample, using seasonal produce form the garden form 1pm on 20th September. We will have produce to sell – so you can try the recipes at home afterwards! Advance notice – Got apples and pears? Bring them to Apple Day on 25th October. You can only store unblemished apples so bring the others along to be pressed for juice and cider. We are open for community gardening sessions every Sunday from 12-4pm and every Wednesday from 2-4pm. There is always a range of jobs to suit all from digging to making tea. There is no need to register in advance – you can just turn up on the day and someone will show you what to do! We have a calendar of events and a garden calendar of what we will be sowing, planting and harvesting from now until the summer. Download our CALENDAR 2015 and see what we are doing each Sunday. Wednesday Workshops 11-1 on 9/23rd September and 14/28th October. Top of the Common (opposite the café) We will be having a stall selling produce from the garden and wooden items made by local wood turner Peter Noy (including some made from wood from the garden or on the Common). Garden open as usual as well. Joan Riley from the Spitalfiields City Farm in the City of London (and one of our inspirational volunteers) will give you an opportunity to ask the question (and many have) “what’s that plant?”and find out the range of exotics in our Hot Bed as she talks about and shares the secrets of the Hot Bed garden and how she created it. Local food writer and cookbook author and a regular and favourite contributor to our programme of events returns to the garden by popular demand and will lead a workshop and cookery demonstration using produce from the garden. She will also be bringing copies of her recipe book. October 4th – Garden closed for volunteer event – regular and new volunteers welcome for a thank you event. Bless the Orchard garden for the New Year and sample our cider – produced from the apples pressed on Apple Day in October. Our contribution to the Streatham Festival. A hunt for bugs and insects around the garden led by volunteers from the Institute for Biology. Come and see who’s staying in the bug hotels and elsewhere in the garden. for those who don’t like bugs join our floral headband making classes in the arbor. We also have plenty of lettuce and salad leaves you can pick for picnics as well as a range of fresh picked produce. if you’re not a regular volunteer (or even if you are) and want a chance to see the garden in it’s evening glory come along. Find out what we’ve been up to and we’d love to hear your ideas for what we should be planning for in the future. 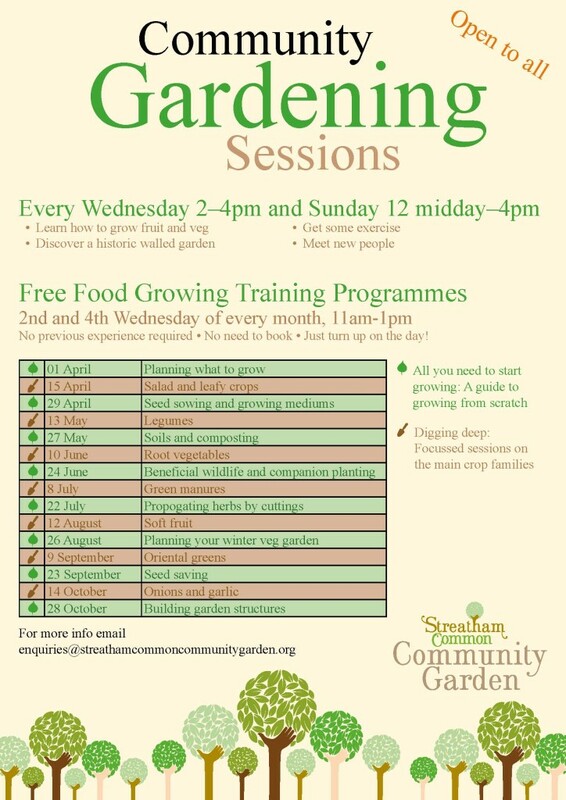 Regular events We are open for community gardening sessions every Sunday from 12-4pm and every Wednesday from 2-4pm. There is always a range of jobs to suit all from digging to making tea. There is no need to register in advance – you can just turn up on the day and someone will show you what to do! We have a calendar of events and a garden calendar of what we will be sowing, planting and harvesting from now until the summer. Download our CALENDAR 2015 and see what we are doing each Sunday. 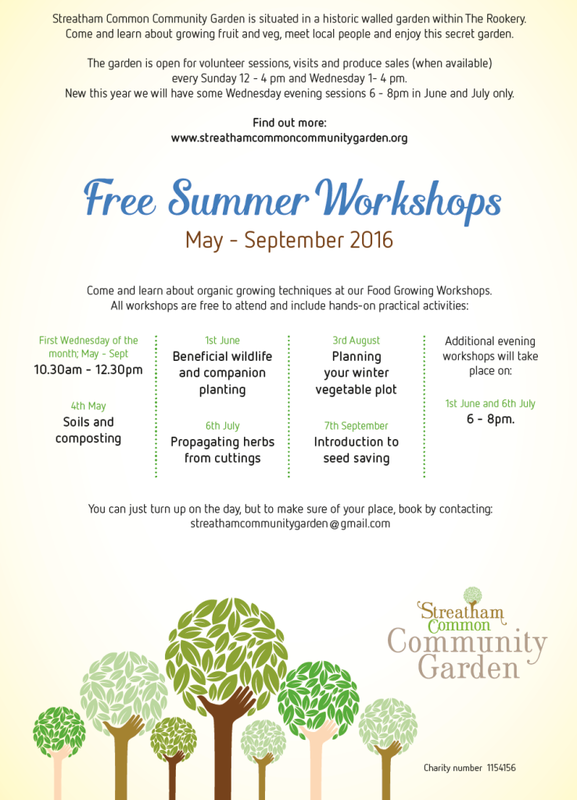 We are offering FREE workshops on different aspects of food growing throughout the growing season – for existing volunteers and those who have never been to garden before. Visit the garden on Wednesday or Sunday to find out more! We are looking for local residents or community groups to plan and manage plots throughout the growing season from March-October 2015. We’ll provide free training and advice; in return you’ll take care of a bed. 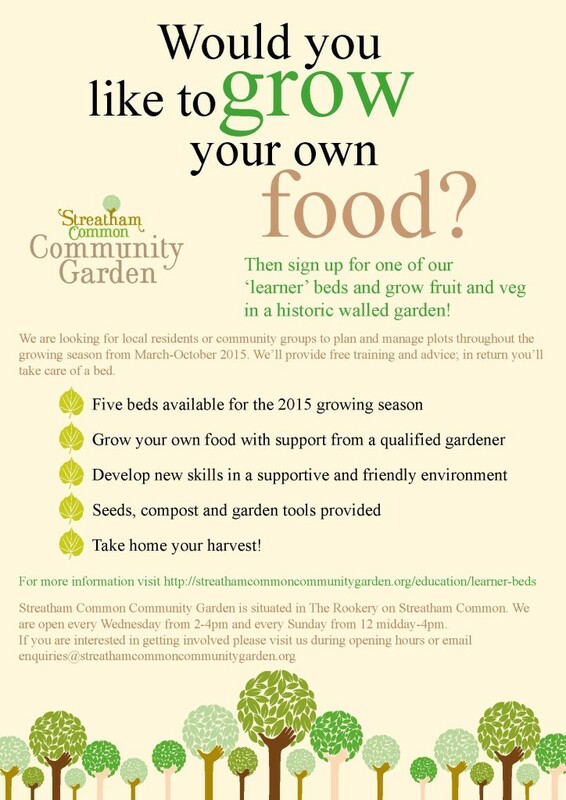 We are open for community gardening sessions every Sunday from 11-3pm in February (except 15th) and March. There is always a range of jobs to suit all from digging to making tea. There is no need to register in advance – you can just turn up on the day and someone will show you what to do! We have a calendar of events and a garden calendar of what we will be sowing, planting and harvesting from now until the summer. From March we will also be open Wednesday afternoons with workshops in the mornings. Learner Plot project open for 2019 applications.. The Garden is open Wednesdays 6th & 13th February and Sundays 10th & 24th February. We are open 11am to 3pm. Copyright © 2019 Streatham Common Community Garden. Registered Charity: 1154156. Built by AgilityWeb.